Spirit is always there loving and guiding us on our journey through life. We all have spirit guides that are there helping us learn lessons, protecting us, and yes communicating to us. Communication through spirit guides comes in many forms. Spiritual communication can come in the form of symbols, colors, numbers, songs, nature, feelings, emotions, animals, finding a book, and meeting new people. Many times spirit uses synchronicity and irony to get your attention. This is how spirit guides ring your bell. The more you pay attention and listen to your environment, the easier it is to realize and strengthen your spiritual connection! The key is to pay attention to the ironic coincidence and synchronicity that occurs in your daily life. Timing is everything! Meditation can be a great way to connect with your spirit guides. There are so many ways to meditate that it is really an easy thing to do. I find it very easy to just sit outside and connect with the outdoors and let my mind go. There are many meditation methods to use. Here is a good simple spirit guide meditation method to try to connect and meet your spirit guides. Just find the best method for you through trial and error. Even meditating on the rune symbol Elhaz can be very helpful and enlightening! 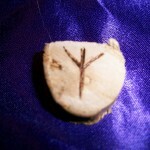 The rune Elhaz (also called Algiz) can be a great tool and resource to use to build a connection with your spirit guide.